Peters and a half-dozen other leading designers, builders and safety experts say GPS-generated electronic navigation, joystick helm control and computer-aided design stand out as the top innovations of the past 20 years. The innovations fall under four categories: electronics, boat design and construction, safety and propulsion. The innovations — the very latest of which will be on display at the International BoatBuilders’ Exhibition & Conference Sept. 17-19 in Louisville, Ky. — have made boating easier for consumers and boatbuilding more efficient and less time-consuming for the industry. The development of the 4-stroke outboard and cleaner, more efficient diesel engines, the increased use of resin-infused composite construction, the EPIRB and inflatable PFDs also rank high on the list. Surprises? Gyroscope stabilization. 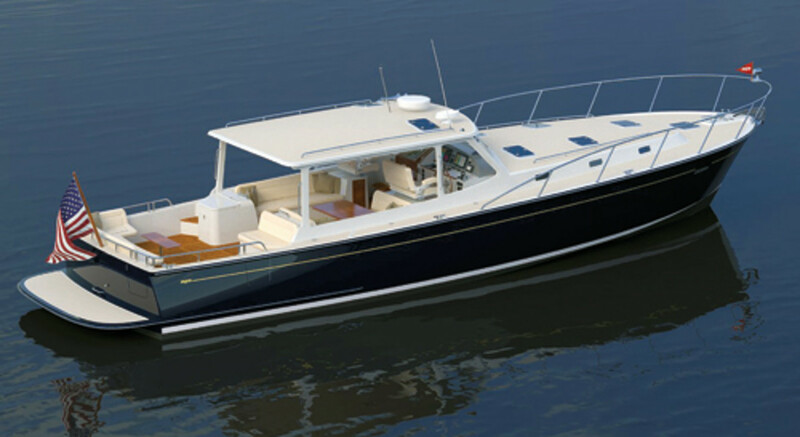 Doug Zurn, president of Zurn Yachts, a design firm in Marblehead, Mass., has the gyro on his list, too. Without a doubt, however, computer-aided design ranks as his No. 1 innovation, with joystick helm control — and the engines and drives that utilize it — as a close second. 3-D printing serves as an example of how the industry can make boat buying more consumer-friendly, but making the operation of a boat easier has been a priority for the industry, as well, evidenced by the number of boats with joystick helm control. At today’s boat shows you’ll find joysticks married to a variety of power options, from outboards and sterndrives to pod drives and straight-shaft setups. Hinckley was one of the first builders to develop and incorporate joystick control with its JetStick and waterjet drives. The company continues to improve the system and is now offering its third generation of the JetStick. The builder also now offers Volvo Penta IPS and joystick as an option, along with its own joystick/waterjet system. Pod drives have had a hand in the joystick’s rise in popularity since 2005, when Volvo Penta’s Inboard Performance System hit the market. “We never knew IPS would have such a tremendous impact,” says Johan Wasterang, Volvo Penta Global vice president of product management. Mercury’s Zeus pod system also incorporates a joystick, and ZF Marine links its pods to its Joystick Maneuvering System. ZF Marine’s JMS can be used with sterndrives as well as conventional inboards. Yacht Controller’s wireless remote control, though not a joystick, gives the skipper precise low-speed maneuverability by interfacing with a boat’s engines, transmissions and thrusters. Those surfaces look better, clean up easier and last longer. It does, however, cost the builder more to make it happen, which contributes to the rising price of new boats, Kaidy says. But innovation also has led to price reductions, especially in the world of electronics. The GPS/plotter has become the hub for myriad technologies. For example, a function within the Volvo Penta and Mercury pod drive and joystick systems works with the GPS to hold the boat on position — at a bridge, fishing spot, etc. Electronics integration with propulsion has kicked into high gear in the past few years. Case in point: Volvo Penta’s Glass Cockpit system collects all navigation information and delivers it to the skipper via one or more displays. It virtually eliminates the need for physical gauges and switches at the helm. Another part of the Glass Cockpit is the Interceptor automatic trim mechanism (made by Humphree) that uses vertically mounted trim tabs on the transom to generate lift and drag so the skipper can control the boat’s attitude in all directions and at virtually all speeds. The lower portion of the blade extends and retracts automatically — together or independently — to change boat position. Technology in the engine room and on the transom deserves recognition, as well. The transition of the outboard from carbureted 2-stroke to direct fuel-injected 2-stroke to 4-strokes with variable valve timing has changed the boating experience. Today’s outboards burn less fuel are quieter, cleaner and more efficient. 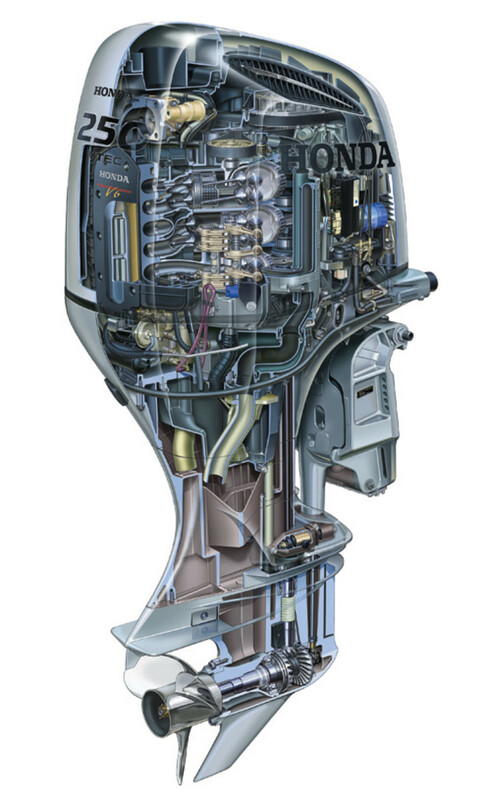 Five of the outboard manufacturers offer a full line of 4-strokes — Honda, Suzuki, Mercury, Tohatsu and Yamaha. Tohatsu and Mercury also carry 2-strokes. Evinrude is strictly 2-stroke. Let’s not forget that today’s diesels are also cleaner, quieter and more fuel-efficient. Companies such as Ranger Tugs take full advantage of the electronically controlled diesel. Environmental mandates have pushed engine manufacturers to build more powerful engines that produce fewer emissions. “I have a friend with a 10-year-old diesel boat, and when you take off you’re leaving a black trail for the first mile,” Deknatel says. Besides running cleaner, this generation of diesels weighs less, takes up less space in the engine room and packs more power, Deknatel points out. The conversion from mechanical to electronically controlled engines should also be considered an innovation, experts say. The technology — used on outboards, sterndrives and diesels — has eliminated the need for throttle and shift cables. “Mechanical shifter throttles were notoriously poor in the saltwater environment, and it really detracted from the customer’s user experience,” Kaidy says. Fly-by-wire engine controls and the use of a controller area network, or CAN bus, which allows different electronic devices to communicate, have improved that experience. The development of the EPIRB with integral GPS is the single largest improvement in boating safety in the past 20 years, says Chris Fertig, an expert on boat handling. This technology’s maturation has made the EPIRB affordable for most boaters, says Fertig, who works for Maersk Line Ltd. as a general manager of its maritime technical services business unit in Norfolk, Va., which provides U.S. flag transportation, ship management and technical services to government and commercial customers. The EPIRB enables first responders to rapidly determine a boat’s position and coordinate response assets accordingly, says Fertig, who was part of a special Coast Guard unit that chased drug runners in the Caribbean. “They’re less than the cost of a tank of fuel for most boats, so every boater who ventures out of sight of land should have a GPS EPIRB on board,” he says.